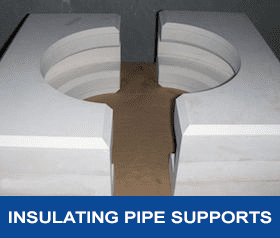 BNZ’s calcium silicate Marinite is the perfect structural insulation material when designing a pipe support system offering maximum insulation for use in either hot or cold applications. While BNZ Marinite delivers excellent structural strength and stability, which will lower your maintenance cost, the low thermal conductivity also adds value and energy cost savings to your overall project. Support size is not an obstacle for BNZ. Fabricated from larger sheets, BNZ can handle just about any support required for your project. Fabricating parts off site in a safe environment can help lower labor costs and potential damage. Prefabrication of an entire pipe section in house can eliminate in the field down time. Having structurally sound Marinite insulation as your support can help eliminate the need for costly repairs and replacement.